From a Mediterranean shore with a vibrant orange hue to a California coastline strewn with multicolored sea glass, we've rounded up seven of the world's most colorful beaches. So grab your camera and visit one of these beautiful shorelines. There's really not much to complain about when you're at the beach: For many, sun, sand and surf provide the perfect antidote to the stress of everyday life. But some beaches up the ante by adding a bit of color -- literally. From a Mediterranean shore with a vibrant orange hue to a California coastline strewn with multicolored sea glass, we've rounded up seven of the world's most colorful beaches. So grab your camera and visit one of these beautiful shorelines. Given the brick-colored cliffs surrounding it, it's not hard to see how Red Beach got its name. This rugged, wine-colored shoreline sits on the southern portion of Santorini's crescent moon shape. Its ruby cliffs overlook the sparkling blue Mediterranean and provide a protected strip for sunbathers. The russet-toned sand and cliffs on Red Beach are remnants of iron-rich lava rocks from a volcanic eruption that took place more than 3,000 years ago. (Be sure to wear plenty of sunscreen so you don't turn the same color.) Red Beach is less crowded than Santorini's popular black-sand beach, Kamari Beach, but it is harder to reach. If you don't mind scrambling over some rocks, you can take a 20 minute bus ride south to Red Beach from Fira. Sure, black isn't technically a color, but we just had to include the gorgeous black-sand beach at Waianapanapa State Park near Maui's easternmost point. Just more than 3 miles north of Hana along the Hana Highway, Waianapanapa is known for the smooth, onyx-colored pebbles that line its shores. The cooling volcanic lava -- remnants of an eruption that took place hundreds of years ago -- that formed arches, spires and blowholes that dot the coastline of the 120-acre state park. On days when the surf isn't too rough, you can swim, snorkel or dive in the crystalline waters. If it isn't prime swimming weather, you can explore the park, which includes the largest documented Hawaiian temple, as well as a network of natural caves and lava tubes. Because of its high levels of iron oxide, much of the sand on Prince Edward Island's shores is a rust color that clashes with the steely blue waters of the Gulf of St. Lawrence. But this island off of New Brunswick has one beach that outshines them all. Darnley Beach, located on Prince Edward Island's north-central coast, is home to stunning geological formations like natural arches and towers, and the famous Teapot Rock, all colored in the same brick red as the surrounding sand. There are a few ways to get to Prince Edward Island: You can hop in a car and drive north from Saint John, New Brunswick, almost 200 miles and across the Confederation Bridge. Or you can take the Northumberland Ferry from Caribou, Nova Scotia (only from May through mid-December). You can also fly in to Charlottetown Airport, which sits about 40 miles southeast of Darnley Beach. On Harbour Island, a small islet located in the eastern portion of the Bahamas, you'll find a luminous, 3.5-mile long pink-sand beach that draws tourists with its laid-back vibe. And because the beach is protected by a coral reef, the Atlantic waves break gently on its rosy-hued shores, making for calm swimming waters year-round. There are also plenty of snorkeling sites within reach of the blushing sand. If you'd like to stay close to the coral sands, be prepared to part with more than a few sand dollars. The upscale accommodations lining Harbour Island, like the Pink Sands Resort and the Dunmore Beach Club, will cost a pretty penny. The best way to get to Harbour Island is to fly from Nassau, Miami or Fort Lauderdale to the North Eleuthera Airstrip (on Eleuthera, the Bahamian island about 3 miles west of Harbour Island) from which you can take a taxi and a quick boat ride to the beaches. Off the northeastern coast of the isle of Malta sits Gozo, a smaller island famous for entrancing travelers with its many wonders. Its most well-known mythological maroon was Odysseus, who, in Homer's "The Odyssey," was entertained by the nymph Calypso in a cave on Gozo for seven years. Today, Gozo is renowned not for its legendary creatures, but for its tangerine-colored beach at Ramla Bay. The cool, blue Mediterranean Sea laps against the ochre-hued sand on Gozo's northern shore, creating a stunning juxtaposition in color. Despite the lure of its gorgeous sands, Ramla Bay is virtually undeveloped. There are a few summertime-only snack bars, so you might want to consider bringing your own food and water. The lack of surrounding development also means it's hard to access: A bus runs from Gozo's capital, Rabat, but only in the summer and it doesn't adhere to a set schedule. Your best bet for catching a glimpse of the orange sands is to walk 2 miles from Xaghra, the closest town, or to drive 4 miles north from the Malta-Gozo ferry dock at Mgarr. It's hard to imagine that what is now a pristine coastline along California's Route 1 used to be a dumping ground for old glass and appliances in the early 20th century. Today, the beach sparkles with the remnants of old glass. Smoothed by decades of pounding surf, the sea glass that washes up on this strip of beach in Fort Bragg resembles shiny gemstones. There aren't any soft, sandy strips to lay down a towel, but beachcombers flock here to sift through the sand for forgotten treasures -- or, in reality, discarded scraps of old glass. Visitors can also stop for a picnic here and admire northern California's churning breakers (it's too rough and cold for most swimmers). 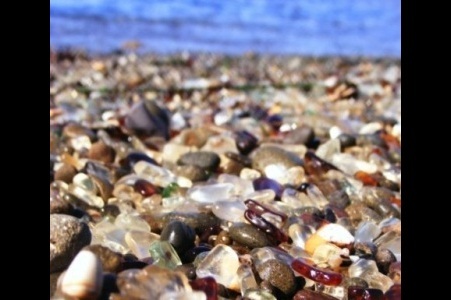 To get to Glass Beach, take Route 1 north about 170 miles from San Francisco, and turn west onto Elm Street to Glass Beach Drive in Fort Bragg, Calif.